After the pool experience in San Diego, where the youngest claimed he could swim and basically dog paddled his way to the bottom of the pool, it was clear that proper training would be required. So we booked lessons for both boys at the local pool. The WGRC. The Walnut Grove Recreation Center is a model of recreation centers. It has a pool, a weight room, a sauna, a ping-pong table in the middle of a staircase landing, a full basketball court where sweaty teenagers push each other around, a library (with actual people in it reading actual books) and a huge staff information area where there’s a sign that says, please check in, but where the staff seem to largely ignore you in favour of talking to each other about the latest, omg catz video on youtube. But the pool is a thing of beauty. Or should I say, ‘pools’. There’s huge hot tub pool where sweaty parents and bored kids hang out. There is a gigantic kiddie’s pool where any struggling 7 year old can stand up, get splashed by water buckets overhead or paddle around in what looks like a nerf canoe. 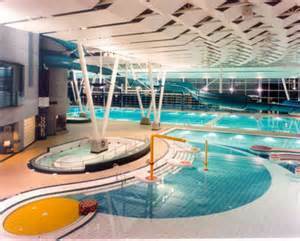 And there’s a gigantic, dare I say, Olympic-sized pool where the more dedicated swimmers swim. A diving platform towers above the large pool, a rope swing hangs about 10 feet from one side of it, and above everything, twisting, winding, swooping ever downward, the most awesome waterslide of all time, (according to the youngest), a full 300 feet of slippery, slidiness. But we’re not here for fun. The boys are here to learn. Seems the oldest never got past his level 3 swimming course. Not that he can’t swim, but the red cross – being an institution of order – requires that someone finish lvl 3 before they move on to lvl 4. The oldest is not pleased. There will be a time in his life that when he’s given the chance to hang out with a group of younger women, he’ll jump at it. Hell, he’ll pray for it. But at his age, 11, girls are still kinda icky and, worse, he’s been assigned to a group that has 5 younger girls. I’m not talking like 10 year olds. I’m talking 5-7 year olds. He towers above them, his arms crossed over his chest, glowering as they giggle and splash and flail around. If there was a look that said, one day, I’m gonna get you for this, mommy, he had that look in the pool. Poor guy. But it’s the price of not completing something, of getting distracted and not finishing. So, he learns with the little kids. However, there’s no goofing around on his part. None. There is no way in hell that he wants to stay in that group. He has to prove to the instructor that he can swim 5 meters, float a bit, go under water without panicking and perform some sort of backstoke I don’t quite recognize. He’s motivated. He’s driven. He wants to be out of that group. Like Sting out of the Police. The youngest, too, is on a mission. He has to learn to swim or he won’t be swimming. Saying “I can swim,” is, much to his surprise, not enough. The bonus is that he’s fearless in water. Like I noted when we went in the hotel pool, that is both a good thing and a bad thing. Like having no fear of hairy, venomous spiders. Less screaming and flailing around when you see one and more, you know, death for trying to play with it. You can see the look in his eyes as he stares up at it, his instructor beginning to explain something super important. The course takes a week. They both have a week to pass. But I have to wonder…Will their willpower to succeed overcome the obstacles? 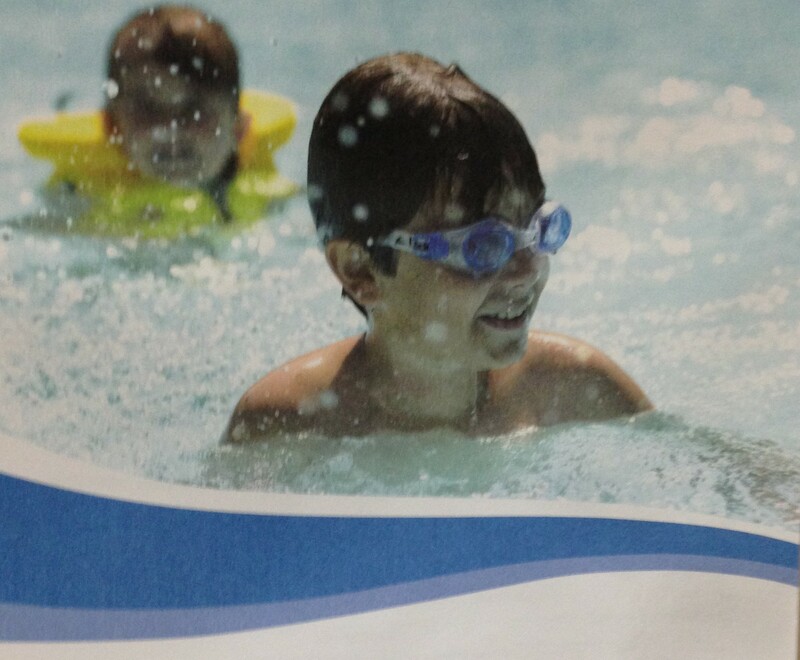 This entry was posted in Blogging, Parenting, Sports, Swimming, writing and tagged humor, humour, langley, learning to swim, pool, swimming lessons, the oldest, the youngest, walnut grove, walnut grove community center. Bookmark the permalink. Hey, the kids just finished a week of lessons there on Fri! My kids were the tallest and I think oldest ones in their groups too. I found the lessons in Langley focus more on technique & less on endurance (a lot less!) and it seemed like there was a bigger difference in the level of abilities w/in their groups. I signed them up for another set of lesson at the end of the month. I like that the youngest actually dog-paddled to the bottom, though. Much more impressive than simply sinking like a stone.